2.5 Liberation or Further Entrapment? Investigate an ancient curse at Direnni Acropolis. Direnni Acropolis — Discover the origin of the Direnni Acropolis curse. I met a High Elf bailiff outside the ruins of the Direnni Acropolis. He told me that an ancient curse lingers within its walls. I must find the source of this corruption and cleanse it. Find the Golden Seal and Keeper's Key in the Keeper's Manor. Place the Golden Seal into the Golden Seal Recess. Place the Crimson Seal into the Crimson Seal Recess. Traverse the Forsaken Undercroft and Lauriel's Crypt to find her physical remains. Choose to either free or bind Lauriel. This quest can be started by speaking to Bailiff Erator, a member of the Divine Prosecution, who has been sent to ensure no rogue spirits exit the acropolis and haunt the nearby area. He can be found sitting on a barrel to the right of the entrance to the acropolis, and will initially make a comment on the current situation. Bailiff Erator: "Did you hear that weeping again? I've had enough of this place …." Speak to him to learn how you can help. "Hm, a traveler? Don't see many wanderers out here near the acropolis. Best give it a wide berth. There's a curse on this place. I didn't believe it at first, but once you hear that ghostly shriek... it'll make you a believer. Trust me." Tell me about this curse. "Ah, I see it - that look in your eye. You mean to go in there and break the curse of the Direnni Acropolis, don't you? Ha. You newcomers are an ambitious lot, I'll give you that. There's a ghost in there called Lauriel. She's the root of it." How is she the cause of this? "Some folk say she was an innocent girl, buried alive by an evil sister. Others say she was a necromancer, put to the sword. Who knows? If you manage to run her off, you'd be doing all of Summerset a favor. Just don't expect us to go in after you." With his permission, you are now free to investigate the acropolis interiors, although without the help of any reinforcements. Head southwest through the acropolis and along the bridge, then turn right to arrive at the Keeper's Manor. The inside is very ominous, but do not fret, as there are no enemies here. Make your way to the top floor and you will find a skeleton leaned against a shrubbery bed. Read the Keeper's Letter which lays in the hand of the skeletal corpse. After reading the letter, a Ghostly Keeper materialises from the skeleton and orders you to ensure that the catacombs are kept protected. Ghostly Keeper: "The seal. The key. Take them. We must keep her locked away. Do not let her escape!" The ghost will then promptly disappear. Search the Keeper's Coffer beside the skeleton to retrieve the Golden Seal and the Keeper's Key. Now that you have the key, you may enter the Direnni Catacombs. "When bone and death shroud stir below, may these eyes see flames alight"
The entrance to the Direnni Catacombs is to the northeast of the Keeper's Manor. Enter through the door and travel down the stairs to reach the stone tablet at the centre of the room. Examine the inscription to learn how the Keepers have been assigned the role of containing a soul deep within the tombs. Place the Golden Seal within the Golden Seal Recess on one of the pillars outside the entrance to the inner tombs, and a ghostly figure named Lauriel will appear before you. "A Keeper? No... no an intruder. Did you not hear the shrieks? The groaning admonitions? This is a cruel and sour place, outsider. Your beating heart mocks the dead." "Who am I? I was called Lauriel. But in truth, I am sorrow given voice... agony given form. A prisoner, confined to this cold, dead acropolis for all time. You were brave to come here. But are you brave enough to seek the truth of this place?" Yes. Tell me what happened here. "I haven't the heart to speak it aloud. I can only bear the pain through song. Even now, all these long centuries later, the taste of betrayal still fills my mouth. My soul is bound to the catacombs. Sealed away in a vault of stone deep below." How do I find this vault? "You carried the Keeper's Golden Seal. There is another—a Crimson Seal. It is close. I sense its presence... like a whispered accusation. Follow my voice. Find the Crimson Seal and place it here beside its golden brother. They will clear the path." Enter through the door on the right to explore The Shattered Halls, in search of the Crimson Seal. You will need to fight ghosts and skeletons as you travel further into the catacombs, while following Lauriel's voice as she sings her story to you. She begins reciting her tale as soon as you enter The Shattered Halls. Lauriel: "Hear ye my tale of sisters, two, bound by love and joy …"
Then she recites her next line as you travel further into the catacombs. Lauriel: "The elder set sail, but the younger remained, alone with her tomes and her heartache …." And then another line as you get closer to the Crimson Seal. Lauriel: "At length a caller came to the gates of the Direnni—a fellow traveler on sorrow's road, with dark wisdom on his lips." You will then find a skeleton of a Keeper in the centre of a brightly lit room. Search the Keeper's Remains for the Crimson Seal, and the Crimson Keeper will appear before you in a red-tinted ghostly form. Crimson Keeper: "Behold, the Crimson Keeper. Keep to the oath, seal-bearer. Do not believe her lies. She is not what she seems." Now return to the foyer by continuing forward - the path will loop back and drop you into the right room - and place the Crimson Seal in the Crimson Seal Recess on the other pillar. With both of the seals in their recesses, the entry to the Forsaken Undercroft will be opened to you. Traverse its bridges, halls, and staircases until you reach the bottom of the tomb. As you cross certain bridges, you will hear the shrieks of haunting spirits call out to you. One of these spirits screams out as you cross the first bridge. Tormented Spirit: "Don't listen! Her words are poison!" And then another as you cross the second bridge. Tormented Spirit: "Her heart is twisted! She deserves this fate!" Upon reaching the end of the undercroft, Lauriel will finish reciting her tale to you. Lauriel: "All her heart's doors closed and locked, the sister's power grew—her gold eyes fixed on graves and tombs, the necromancer's muse." Lauriel: "At length the eldest did return, flush with arcane might. She found her sister's undead thralls, and wept long at the sight." Lauriel: "Knowing death could not contain her sister's newfound power, the eldest and her Direnni kin buried me alive … here, screaming into the black." Enter through the door into Lauriel's Crypt, which will open up into an underground grotto. Follow the path across the bridges, and you will have the opportunity to slay Lady Adreana, a powerful wispmother boss. Lady Adreana: "You are no Keeper! Don't you see what she has done? I will not let you free her!" 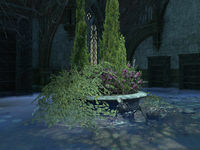 Continue heading towards the cylinder-like structure at the centre of the crypt until you come across Lauriel again. Lauriel: "You found me. At last …." Speak to Lauriel, where she will outline the choice that stands before you. "Do you see? What they did to me? What they are still doing? Is a young girl's curiosity worthy of this torment? I only wish to pass on—to be free of this place. Please, help me." "You see my prison now—this circle of braziers. The Keepers would have you relight these fires to whip me back into silence. But I beg you, take up the Keeper's Flame and burn my corpse. Without my body, the Direnni's cruel magicks cannot bind me." Move to where Lauriel's dessicated corpse is laying on the stone platform, and pick up the Keeper's Flame that is within the scone beside the platform. Lauriel will then remind you again of the choice you need to make. Lauriel: "We arrive at the moment of choice. Please, use the Keeper's flame on my remains and set me free." Now you must either free Lauriel's spirit, or light the Sanctified Brazier to ensure that she remains bound to the crypt. 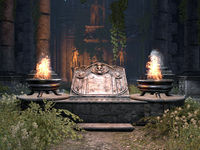 Lighting the brazier causes her to curse and threaten you, before she is bound again. I feel the chains slipping from my shoulders. My spirit is free... free, to go wherever I wish. Oh, you have done quite a deed. Your kindness will not be forgotten... or squandered. I'm sure you have many questions. I'm sorry I cannot stay to answer them. I have much to do. So much to do. Farewell." After that somewhat unnerving comment, she vanishes with a burst of blue light. All you have left is to return to Erator and explain what transpired. "No! Why would you…! Agh! I … trusted you! You're just like them! Just like my family! Curse you! I won't go back! I won't! I'll kill you all! Needs further documentation on both choice outcomes. Regardless of your decision, you need to inform Erator of what transpired here. Behind Lauriel's tomb is a rocky cavern path that will guide you back to the central catacombs, where you placed the seals before. After dropping down, turn right and take the stairs up to return to the surface. Once outside, navigate the garden and find the stairway to the southeast that leads down to a camp, where Bailiff Erator awaits. "Ah, you're back. Sorry if I seem surprised. Honestly, I wrote you off as dead the minute you walked through those gates. No offense. Brought something for me, eh? A key ... with the Direnni seal? What exactly did you find in there?" I found Lauriel's spirit bound in the catacombs. I set her free. "Ugh. Look, I don't know how you do things ... wherever it is you come from, but here on Summerset, we try not to set evil spirits loose. At least the weather cleared a bit. Here, I'll pay you for that key and we'll pretend this never happened. Fair?" Nirunar: "By the ... what was that?" Sawen: "Where is it going?" Nirunar: "North, looks like. Out to sea. Toward Balfiera." Brought something for me, eh? A key … with the Direnni seal? What exactly did you find in there?" I found Lauriel's ghost wandering the catacombs. I rebound her to her tomb. "Well thank goodness for that. I did notice the sky cleared up a bit. Maybe I'll finally be able to go home.I'll take that key off your hands if you'll part with it. The justiciar would find a use for it, no doubt. We have a deal?" Nirunar: "Did you hear that?" Sawen: "It sounded hurt and angry. The fog may have cleared but I'm still never going in there." Bailiff Erator gave me his blessing to search the acropolis grounds. Perhaps I can find some clues as to what happened here. The note I found indicated that a group of Elves called the Keepers were charged with protecting something in the castle catacombs. This one is carrying a key and a seal. I might be able to use them to explore further. I should use the key I found to enter the catacombs. Perhaps I'll find more answers there. I discovered an ancient stone tablet. I should examine it to see what it says. It might explain how to use this golden seal. The inscription on the tablet referenced the "Eyes of the Keepers" looking upon something below. A recess in a nearby pillar looks like a perfect fit for the seal. I should slot it in and see what happens. A ghost suddenly appeared. I should talk to it. The ghost identified itself as Lauriel and told me that it was bound to the lower catacombs, deep beneath the acropolis. I must find a Crimson Seal to gain entry to the acropolis' nethermost depths. I found the remains of a Keeper and the Crimson Seal. I should take it back to the main foyer of the catacombs. Now that I have the Crimson Seal I can place it on the pillar opposite the Golden Seal and open the way to the lower catacombs. I should search the lower catacombs for whatever is tormenting Lauriel's spirit. I found Lauriel's physical remains. They've been preserved and bound here for some reason. I should ask Lauriel's ghost about this. Lauriel wants me to free her spirit by burning her remains. Conversely, I could light the Sanctified Brazier and bind her spirit back to her corpse, preventing her escape. I must take up the Keeper's flame and choose. With the Keeper's Flame in hand, I must choose whether to burn Lauriel's remains and free her spirit, or light the sanctified brazier to bind her once more. I elected to light the Sanctified Brazier, thus binding Lauriel's spirit to her tomb once again. I should return to Erator and tell him about all that's transpired. This page was last modified on 4 January 2019, at 23:46.